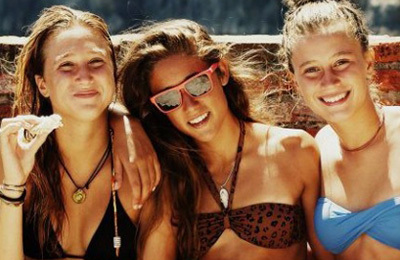 La salvé and Berria Teens Surf Camp - San Miguel de Aras, Laredo, Cantabria Guests overall rating: ☆☆☆☆☆ 0 based on 0 reviews. The accommodation is part of a tourist hostel. It complies with all regulations for housing a group of teens and the accommodation and food provided is perfectly suited to our needs. Healthy, balanced meals are prepared on site to give attendees all the energy they need for the range of activities each day. Safety is our outmost concern. Attendees are supervised day and night by a team of instructors and monitors. This camp has developed over the years. It is run by education and sport professionals with a clear objective in mind: for the attendees to enjoy themselves while developing useful skills and values. We provide them with a well-rounded experience. Each room sleeps six or eight people and these are assigned according to age and gender. We also take into account your preferences (friendships) when assigning dormitories. Surf 5 days: every day we travel to different beaches by bus, seeking out the best surfing conditions to learn to surf. Language classes: as we also have a wealth of experience in running professional language camps, with qualified teachers and instructors, if you are interested in improving your Spanish then we can help. You will not learn in a class setting, but in a fun dynamic way. But that isn’t all, there are a whole host of other activities included too. The surrounding area is completely natural, there are no towns nearby. This means that we can offer a wide range of activities and fully experience what the mountains have to offer. The closest city is Laredo in the north of Spain, which is well known for its tourism. Its medieval city was declared a Monumental Site of Historic and Artistic interest in 1970. The 13th and 14th centuries come to life through Laredo’s historic large houses, palaces, towers, churches, convents and the remains of the city walls. In the sixties international tourism came to Laredo and it was dubbed as the “Capital of the Costa Esmeralda.” Today it remains one of the most well-known tourist towns in the north of Spain. Return transfers from Santander (SDR) or Bilbao (BIO) airport or from the main bus/train stations of these cities are included within the price. Please remember that these will only operate on the stated start and finish dates of the camp. These prices include five days of surf lessons. It can be extra 4 days, the price increases 82 Euros!